Wakened by the sun's warming glow. When life was peachy as pie. But it stands tall and doesn't bend. the weather all will mend. 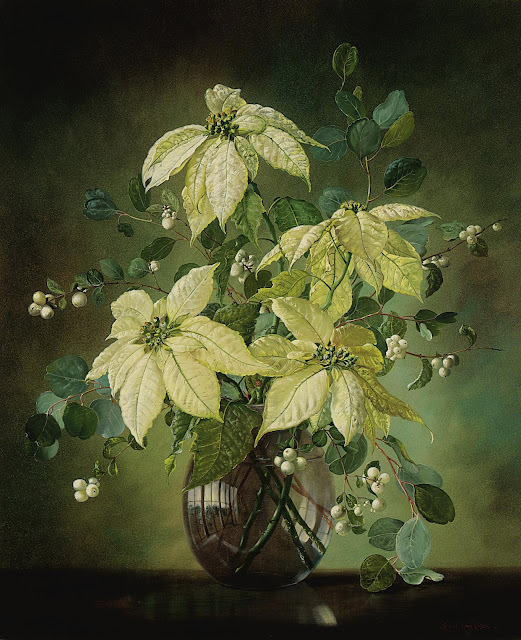 Poem and photo © 2018 FieldandGarden.com. All rights reserved. They wore their strange beauty like war paint. I love the scent of winter. 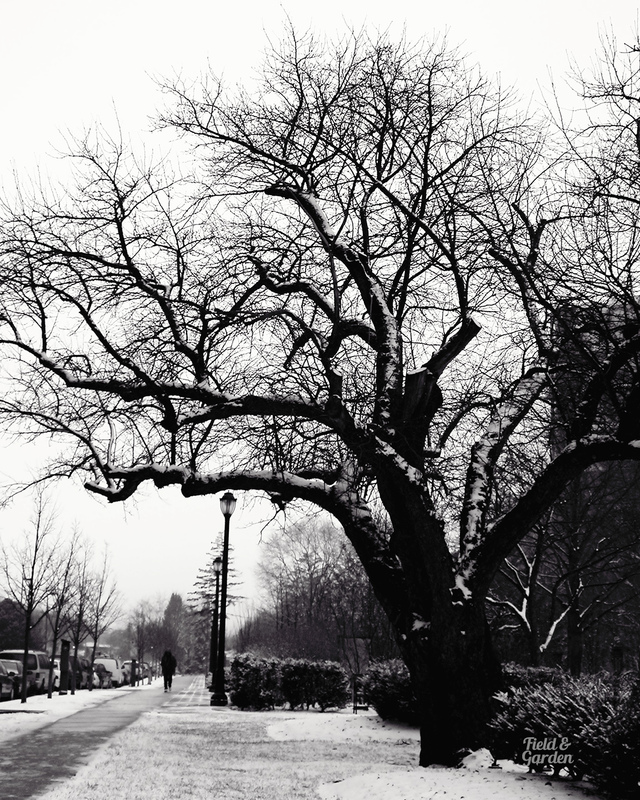 I love the scent of winter enough to suffer the cold for it. Take the time to celebrate stillness and silence and see the joy that the world can bring, simply. who are insensible to everything but toiling and talking of it and that to no purpose. Have you ever heard the wonderful silence just before the dawn? Or the quiet and calm just as a storm ends? Or perhaps you know the silence when you haven't the answer to a question you've been asked, or the hush of a country road at night, or the expectant pause of a room full of people when someone is just about to speak, or, most beautiful of all, the moment after the door closes and you're alone in the whole house? Each one is different, you know, and all very beautiful if you listen carefully. For the first time, she did want more. She did not know what she wanted, knew that it was dangerous and that she should rest content with what she had, but she knew an emptiness deep inside her, which began to ache. Wonderfully drawn antique border featuring early blooming Christmas roses (Hellebore orientalis) that have come into flower even with winter chill and snow falling around them. 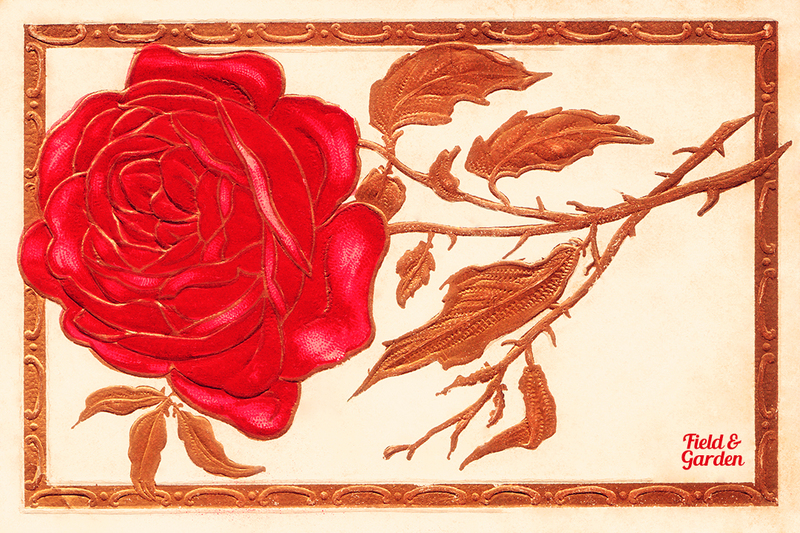 You can use this to decorate a journal or scrapbook page, as a gift tag, for an invitation card or to embellish a photo. You can download the high-res 6.5" x 9" @ 300 ppi .PNG file with a transparent background here. For you little gardener and lover of trees, I have only a small gift. Here is set G for Galadriel, but it may stand for garden in your tongue. In this box there is earth from my orchard, and such blessing as Galadriel has still to bestow is upon it. It will not keep you on your road, nor defend you against any peril; but if you keep it and see your home again at last, then perhaps it may reward you. 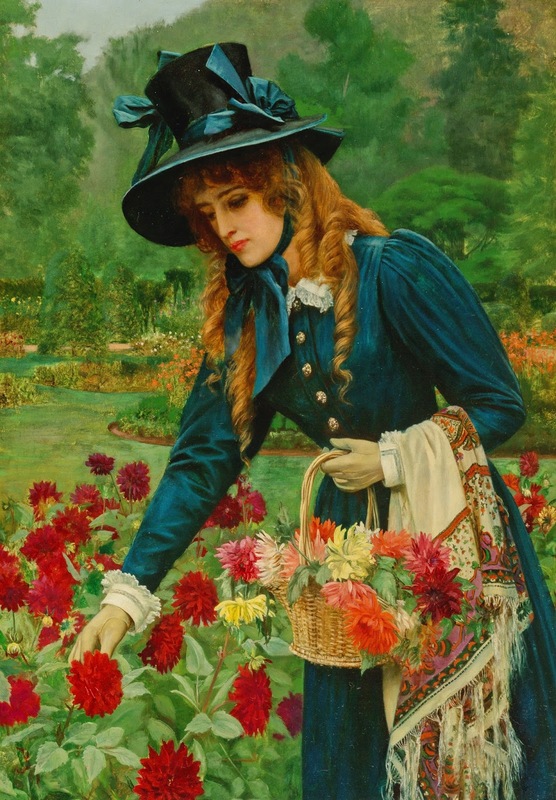 Though you should find all barren and laid waste, there will be few gardens in Middle-earth that will bloom like your garden, if you sprinkle this earth there. 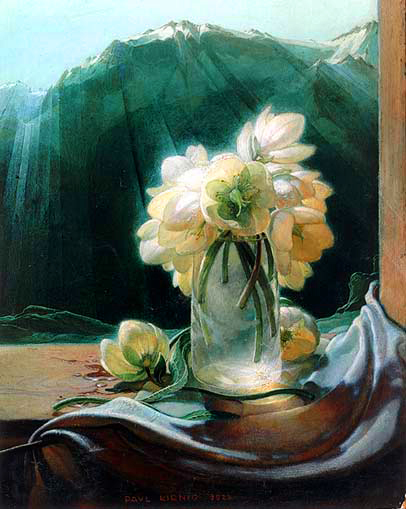 Then you may remember Galadriel, and catch a glimpse far off of Lórien, that you have seen only in our winter. 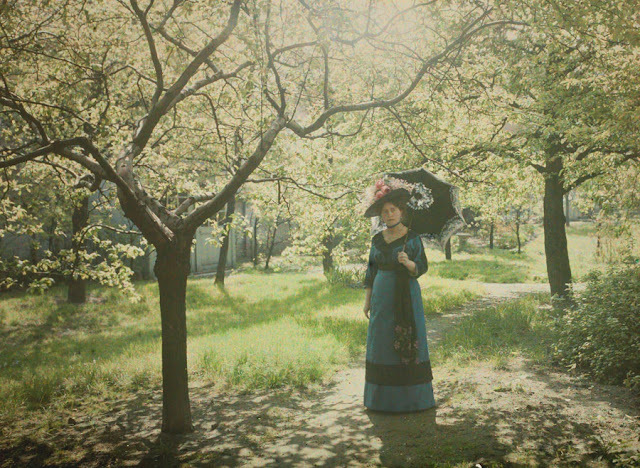 For our spring and our summer are gone by, and they will never be seen on earth again save in memory. and skating well is the great art of social life. An antique illustration from 1886 that shows two Victorian ladies in warm winter outfits and wearing ice skates on their feet. Use together or separately to decorate journal and scrapbook pages or in graphic design projects such as gift tags, bookmarks, cards, labels, brochures or reports. You can download the high-res 12" x 12" @ 300 ppi JPEG without a watermark here. A digital journal template featuring three friends (family?) gathered together in the garden for conversation and perhaps advice? You can download this free high-res 4" x 6" @ 300 ppi JPEG here. Can also be used as a background for card making and other graphic design projects. 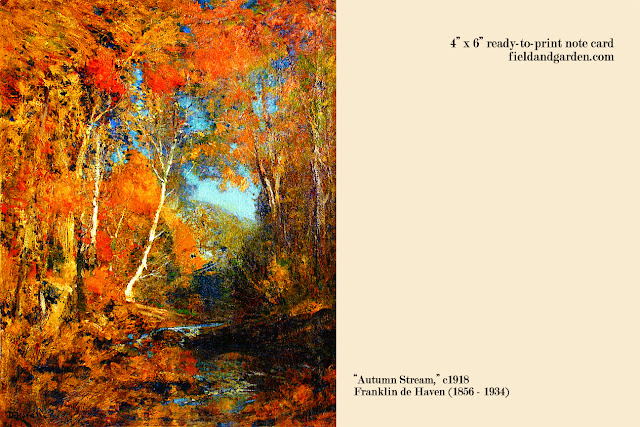 A ready-to-print fine art note card featuring a landscape painting by American artist Franklin de Haven (1856 - 1934), titled "Autumn Stream," painted roughly around 1918. You can download the high-res 6" x 4" @ 300 ppi JPEG without a watermark here. For personal use only, not meant for mass distribution. Please cite FieldandGarden.com as your source where possible. 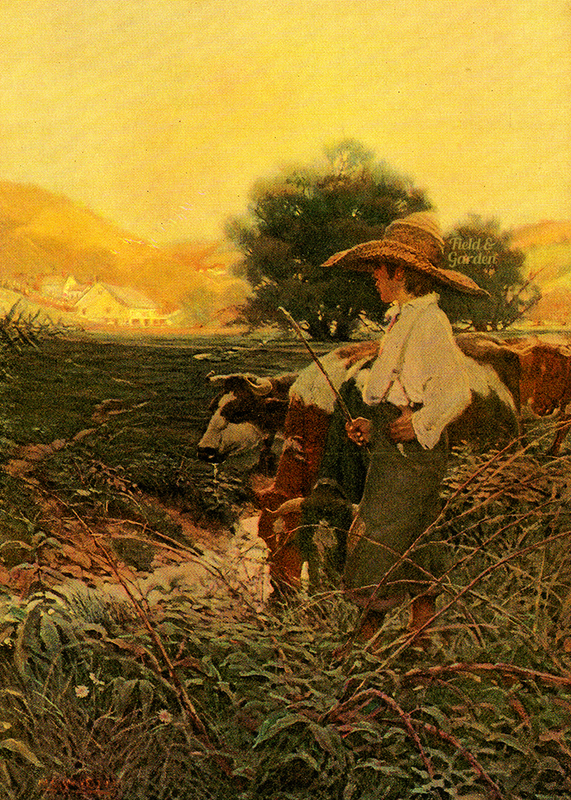 Part 4 (of 4) of a poem by Martha Gilbert Dickinson Bianchi called "Back to the Farm" and illustrated by N.C. Wyeth. F'er the full moon complacent loiters o'er the hill. 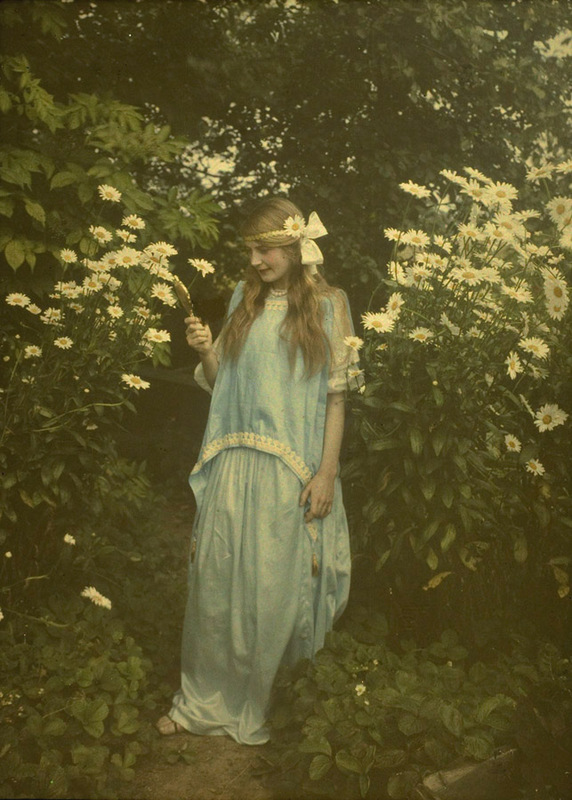 Where youth and Nature beckon, the tryst who would not keep? Back to the primal joys of hunger and of sleep! You can download the free high-res 5" x 7" @ 300 ppi JPEG of the illustration above for scrapbooking, card making or graphic design projects here. 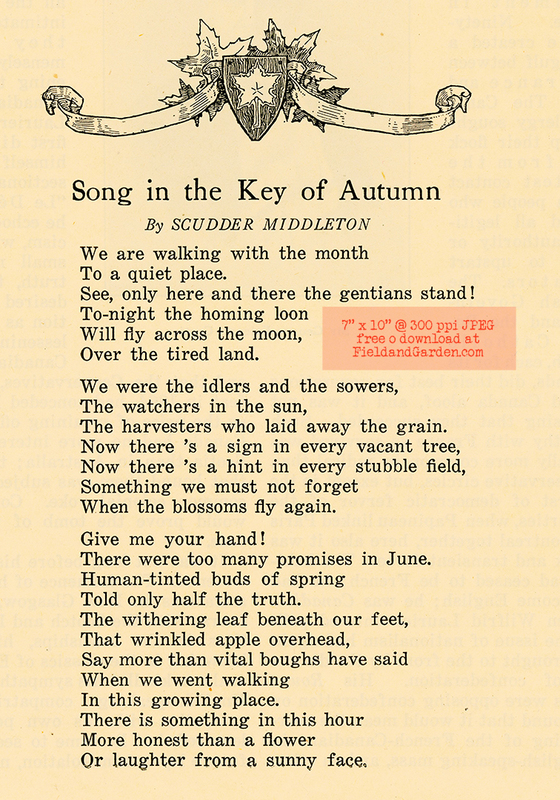 All digitized poems and digital scans by FieldandGarden.com are licensed under a Creative Commons Attribution 4.0 International License. Please cite FieldandGarden.com as your source when using this work and/or provide a link back to this page. Part 3 (of 4) of a poem by Martha Gilbert Dickinson Bianchi called "Back to the Farm" and illustrated by N.C. Wyeth. With songs of winter fires a-ripple through the leaves. When the reeling swallow her dusky pattern weaves. 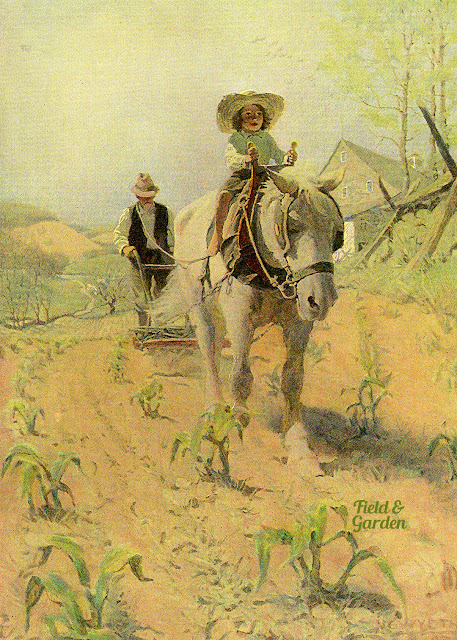 Part 2 (of 4) of a poem by Martha Gilbert Dickinson Bianchi called "Back to the Farm" and illustrated by N.C. Wyeth. Hearing insect lovers a-piping out of tune. Each in fragrant season filling Plenty's golden horn. Part 1 (of 4) of a poem by Martha Gilbert Dickinson Bianchi called "Back to the Farm" and illustrated by N.C. Wyeth. Her immemorial wandering fears and joys! Just for the sense of earth and ripening again. 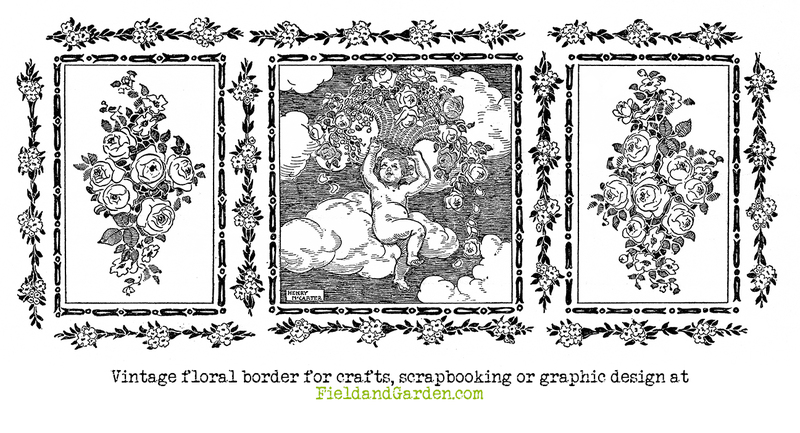 An art deco style border that features three decorative panels: both the right and left panels show bouquets of roses while the middle panel features a cherub carrying a basket of roses aloft with fluffy white clouds in the background. All three panels are surrounded by trailing wreaths dotted with tiny clusters of three or four blooms. You can download the high-res print-quality JPEG here for a garden journal, scrapbooking page or a graphic design project. Life is made up of a collection of moments that are not ours to keep. The pain we encounter throughout our days spent on this earth comes from the illusion that some moments can be held onto. Clinging to people and experiences that were never ours in the first place is what causes us to miss out on the beauty of the miracle that is the now. All of this is yours, yet none of it is. How could it be? Look around you. Everything is fleeting. To love and let go, love and let go, love and let go...it's the single most important thing we can learn in this lifetime. for this day shall never return. See, only here and there the gentians stand! The harvesters who laid away the grain. When the blossoms fly again. There were too many promises in June. Told only half the truth. Or laughter from a sunny face. 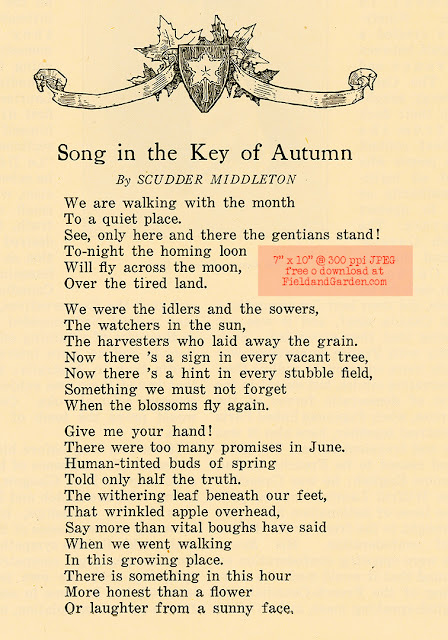 The poem, "Song in the Key of Autumn," was written by Scudder Middleton and published in the November 1919 issue of Century magazine. 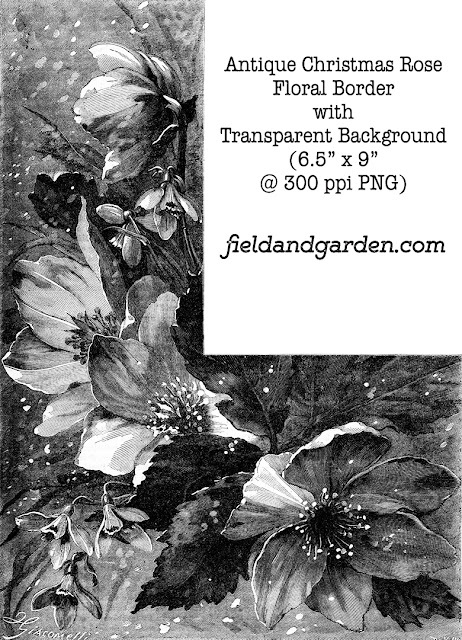 You are welcome to download the free high-res 7" x 10" @ 300 ppi scan without a watermark for a garden journal, scrapbooking or graphic design project here. Before the fruits of prosperity can come, the storms of life need to first bring the required rains of testing, which mixes with the seeds of wisdom to produce a mature harvest. We were put on this magical planet, not to dominate and consume her, but to care for her and love her. To harrow gently. To harvest gratefully. To build reasonably. In life, we plant seeds everywhere we go. Some fall on fertile ground needing very little to grow. Some fall on rocky soil requiring a tad bit more loving care. While others fall in seemingly barren land and no matter what you do; it appears the seed is dead. Nevertheless, every seed planted will have a ripple effect. You could see it in the present or a time not seen yet. So be wise about where you plant your seeds. Be very mindful of your actions and deeds. Negativity grows just as fast if not faster than positivity. And your harvest will be abundant living. I go to sleep alone, and wake up alone. I take walks. I work until I'm tired. I watch the wind play with the trash that's been under the snow all winter. Everything seems simple until you think about it. Why is love intensified by abscence? You felt a deep sorrow, the kind of melancholy you feel when you're in a beautiful place and the sun is going down. 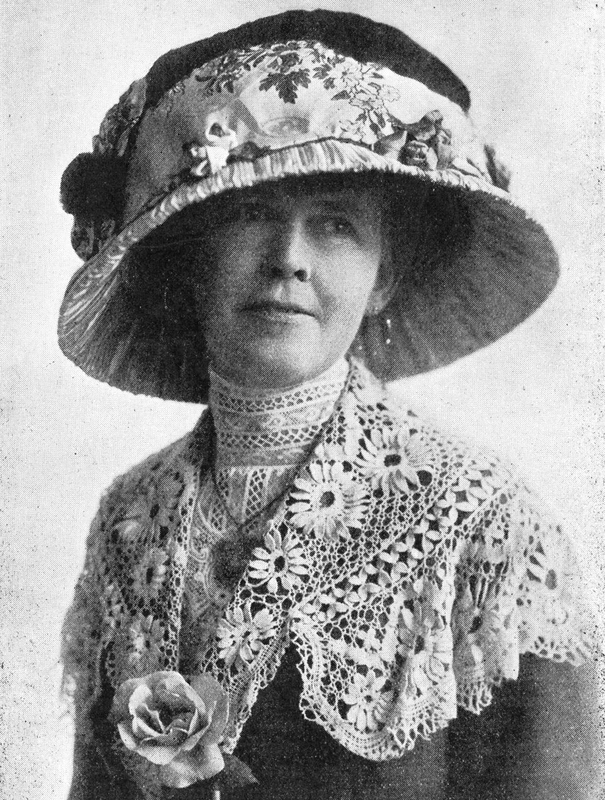 A series of photographs from the early 20th century by Belgian artist Alfonse Van Besten (1865 - 1926). 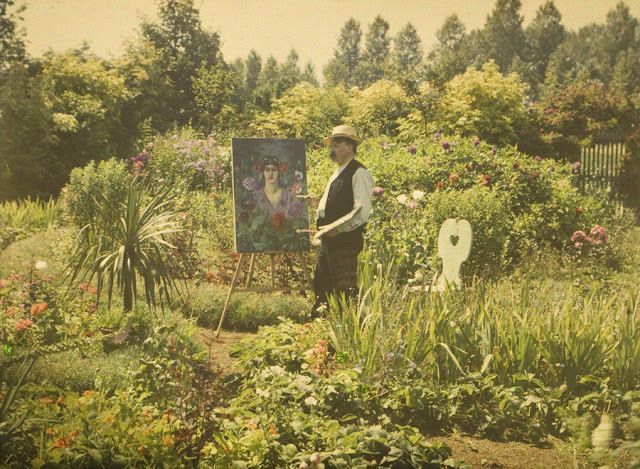 Van Besten was a painter and many of his autochromes were taken with a "painterly eye." 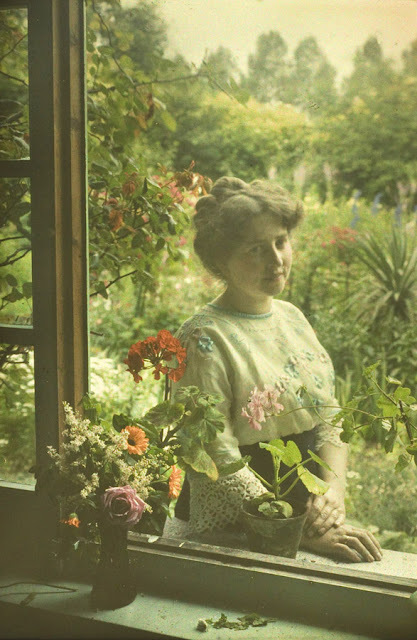 You can find many more of his autochrome photographs on the Belgian Autochromists website here. and be your uniquely beautiful and talented self. 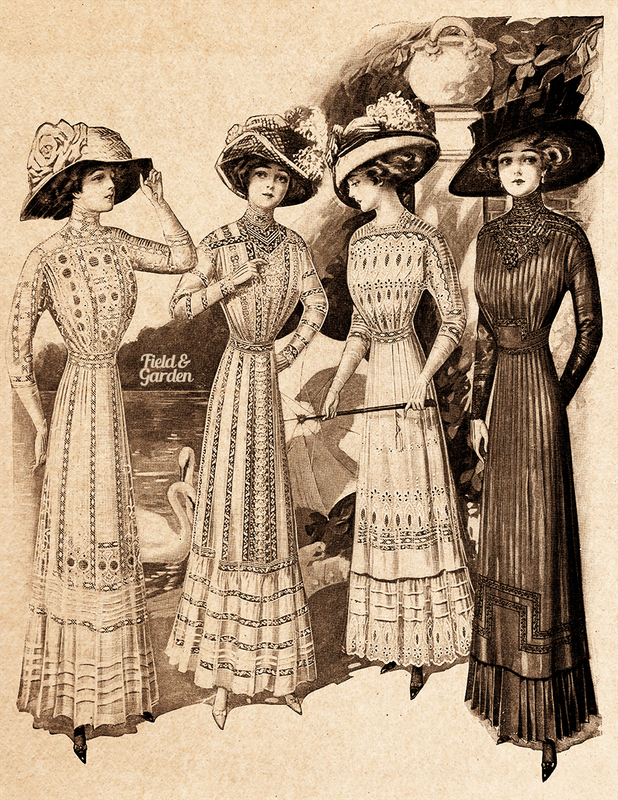 A quartet of young ladies standing around a garden terrace overooking a lovely lake with white swans. You can download the 8.5" x 11" @ 300 ppi JPEG without a watermark here. 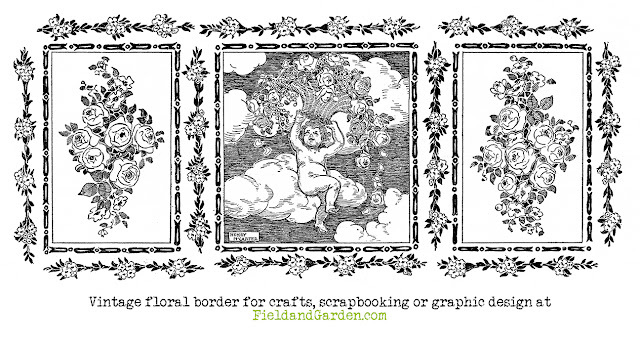 Can be used in craft projects, garden journals, scrapbook pages or for graphic design. "There is no pretending," Jace said with absolute clarity. “I heard what you said. I’m not the silly romantic you think. I don’t want the heavens or the shooting stars. I don’t want gemstones or gold. I have those things already. I want…a steady hand. A kind soul. Illustration of a red and bronze rose from a 1909 vintage postcard. 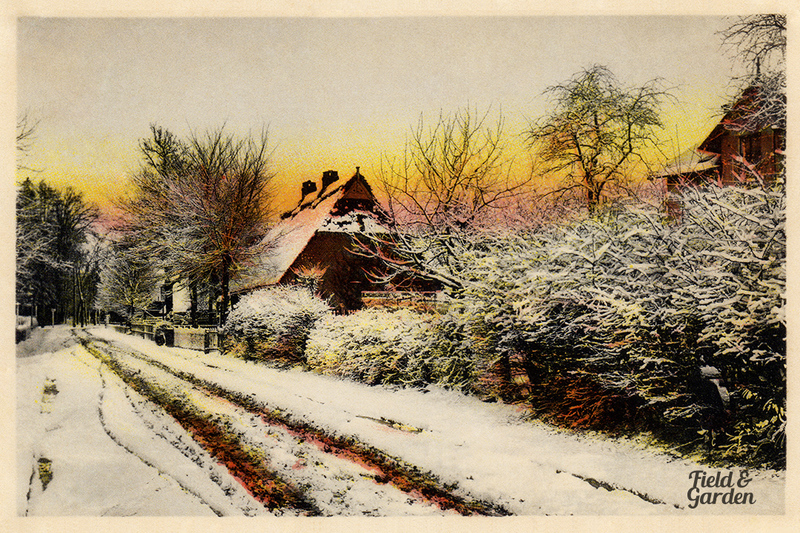 I have left most of the distressed paper elements intact on this one as I feel it gives the image an aged quality perfect for vintage-style crafts, scrapbooking or graphic design projects. To download the high-res 9" x 6" @ 300 ppi JPEG without a watermark, please click here. Most things are forgotten over time. Even the war itself, the life-and-death struggle people went through is now like something from the distant past. We’re so caught up in our everyday lives that events of the past are no longer in orbit around our minds. There are just too many things we have to think about everyday, too many new things we have to learn. But still, no matter how much time passes, no matter what takes place in the interim, there are some things we can never assign to oblivion, memories we can never rub away. They remain with us forever, like a touchstone. Sandry: You're always reading. 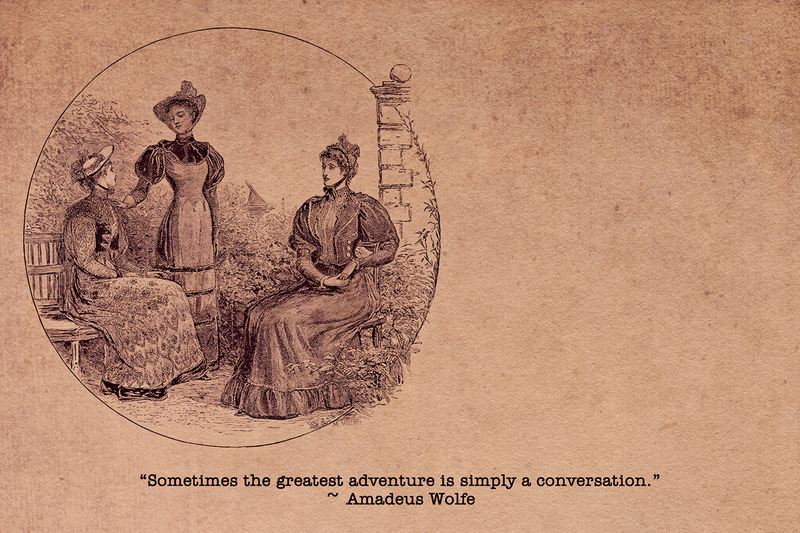 The only way people can ever talk to you is to interrupt. Tris: Then maybe they shouldn't talk to me. St. Augustine said, "The very pleasures of human life men acquire by difficulties." 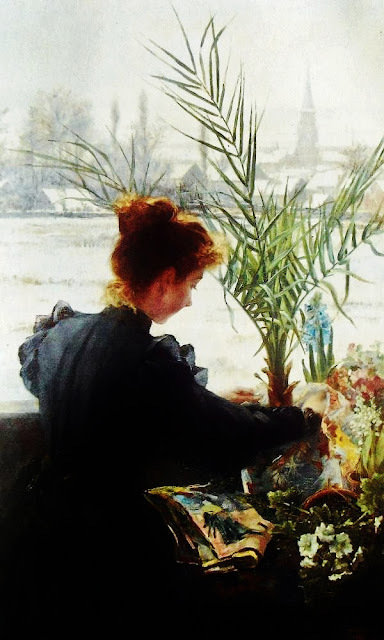 There are times when the entire arrangement of our existence is disrupted and we long then for just one ordinary day - seeing our ordinary life as greatly desirable, even wonderful, in the light of the terrible disruption that has taken place. Difficulty opens our eyes to pleasures we had taken for granted. If you are in a bad mood, go for a walk. If you are still in a bad mood, go for another walk. An antique engraving in colour from April 1904 that shows two Edwardian ladies in their spring dresses out for a walk around the park or garden. 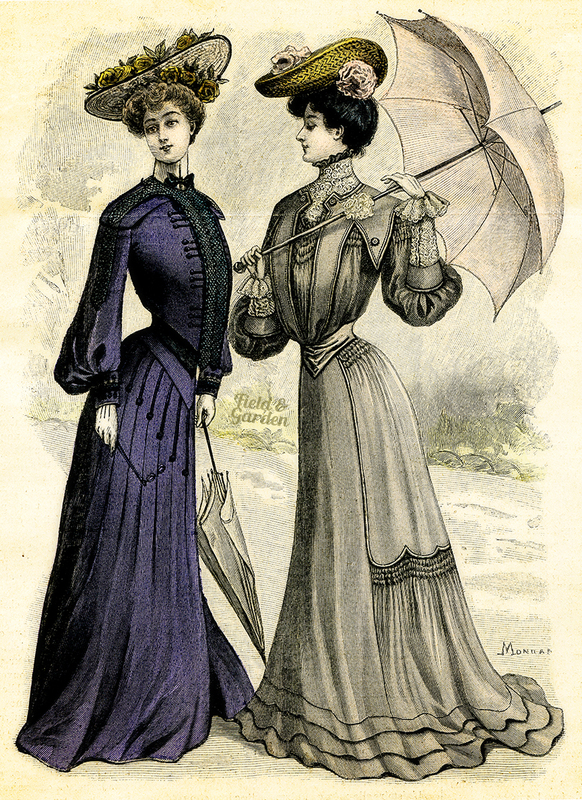 Both ladies are carrying umbrellas, quite prepared to fend off any April showers. You can download the free high-res 8" x 11" @ 300 ppi JPEG without a watermark for use in a walk journal, collage art making, scrapbooking or card design projects here. or could learn to love it. 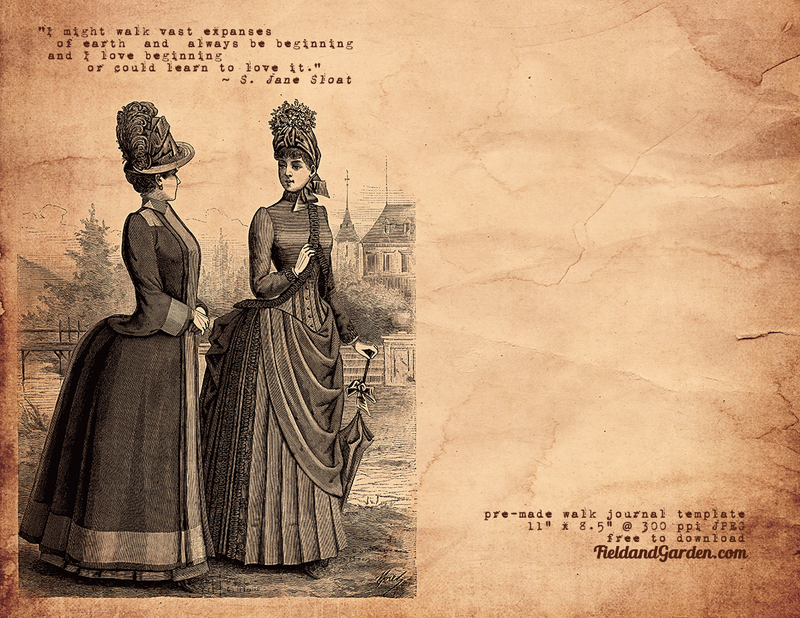 A walk journal (or travel diary) template on old paper texture with an illustration of two Victorian ladies, one of whom is carrying a parasol. You can download the high-res 11" x 8.5" @ 300 ppi JPEG here. 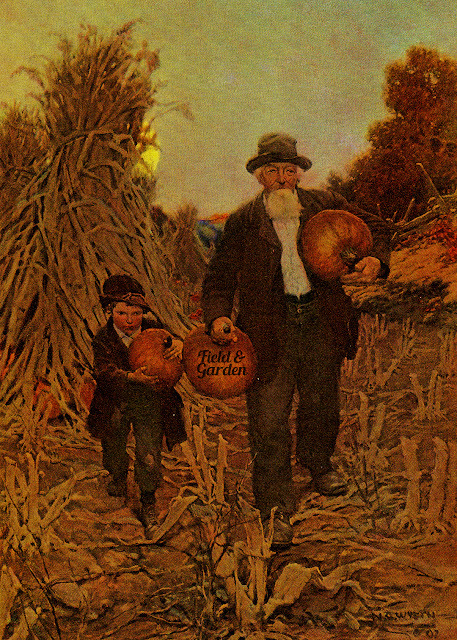 In keeping with the harvest season, I decided to feature a couple of M. Evelyn McCormick's paintings with pumpkins. 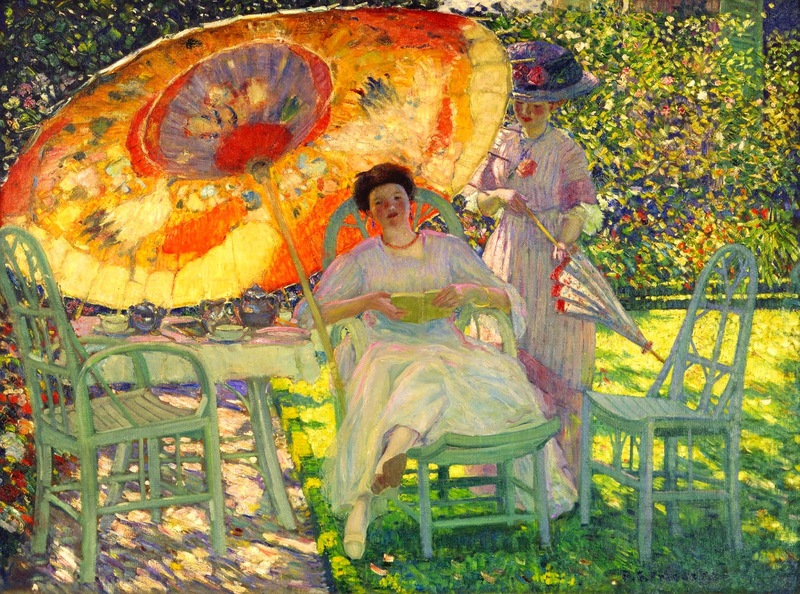 Evelyn McCormick was an American Impressionist painter who lived and worked around San Francisco and Monterey, California at the turn of the 20th century. This intrepid Bohemian travelled to Paris, France in the 1880s to be with her lover, Guy Rose, also a painter. 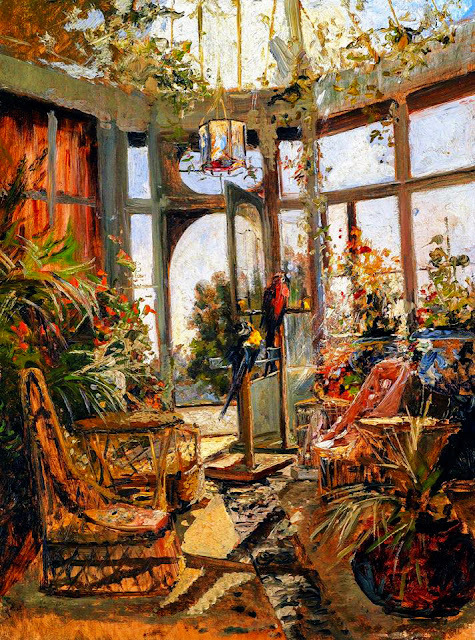 They both spent much time painting in the village of Giverny where they were influenced by the great Claude Monet. 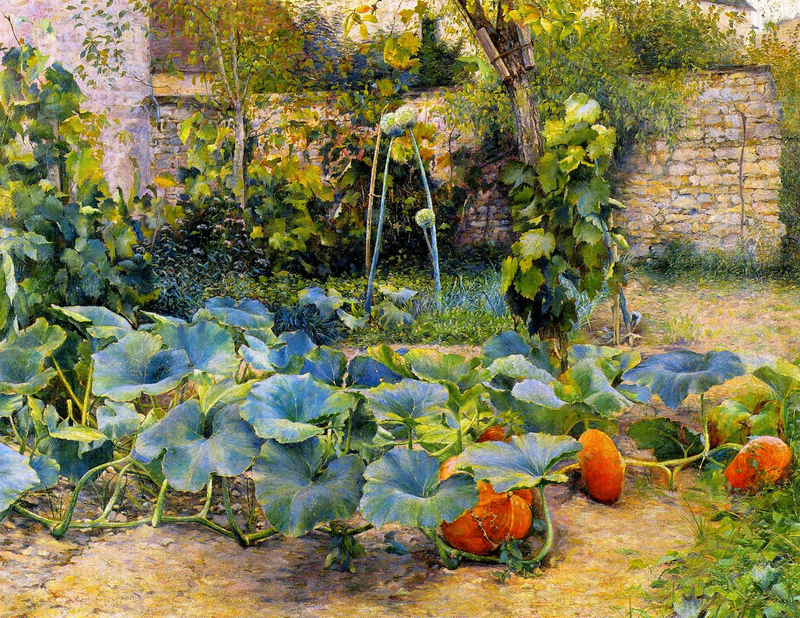 This look at a corner of "A Garden in Giverny" made me think of the pumpkins we once tried to grow in our community garden plot - lots of aggressive leaves and vines but not-so-spectacular pumpkins. There is a charming air of country derelict in this overgrown garden with its tumbledown walls, a dying tree, and all sorts of interesting vegetation rooting everywhere. It feels like the kind of spot that a child might think of hiding in when playing hide-and-seek. Almost 20 years later, back in California, McCormick painted this patch of pumpkins growing on a slope above a pond or stream in the Carmel Valley. The setting under an open sky, wide swaths of greenery and almost-still water feels more expansive than the semi-enclosed, intimate space of the first garden scene. The second image is also a more formal rendering of a landscape, evocative of a prosperous farm, with its lush, neat fields and convenient footpaths. 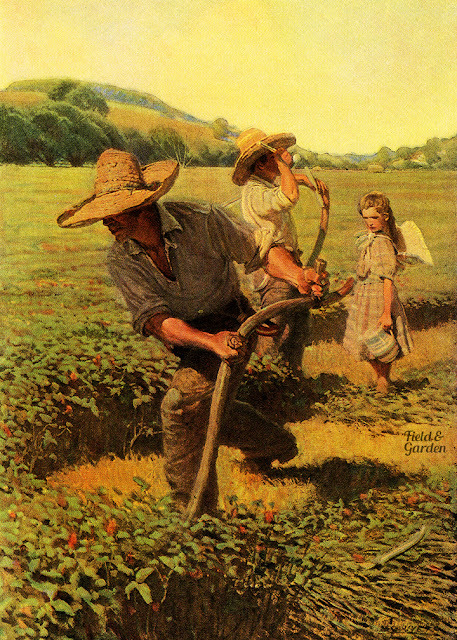 There is almost a sense that perhaps McCormick is trying to convey the idea of an agrarian idyll for her viewers. 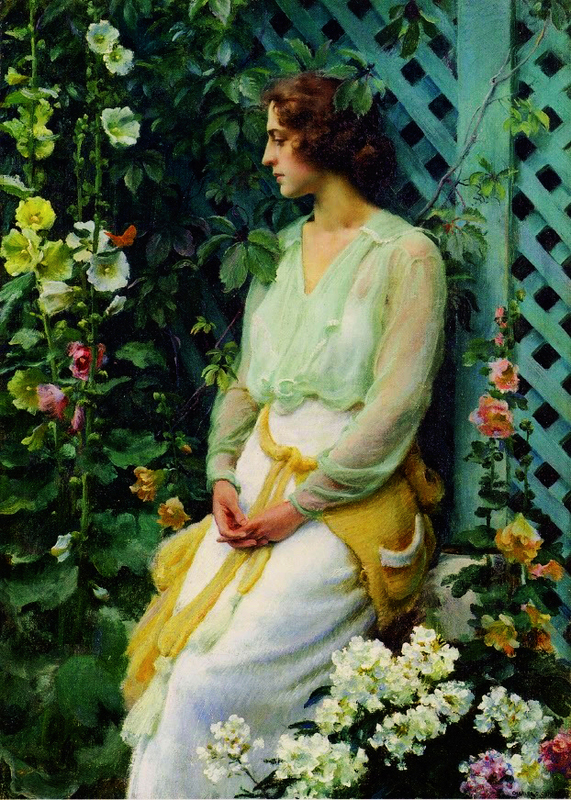 I confess that I'm drawn to the first painting more, despite the rough state of the garden. The atmosphere is relaxed; you don't have to worry about weeding or planning neat borders. 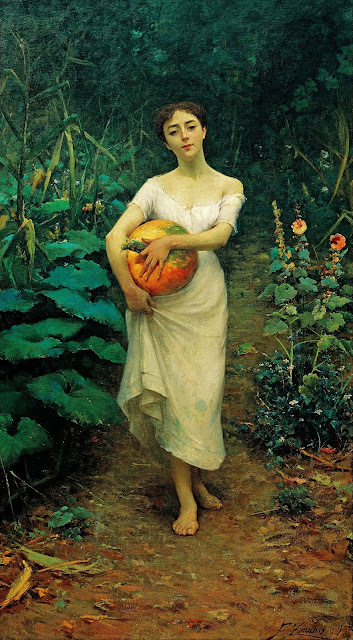 You can graze on a berry or a bean should you come across one, and you can pick a couple of pumpkins to tide you over winter. What about you? 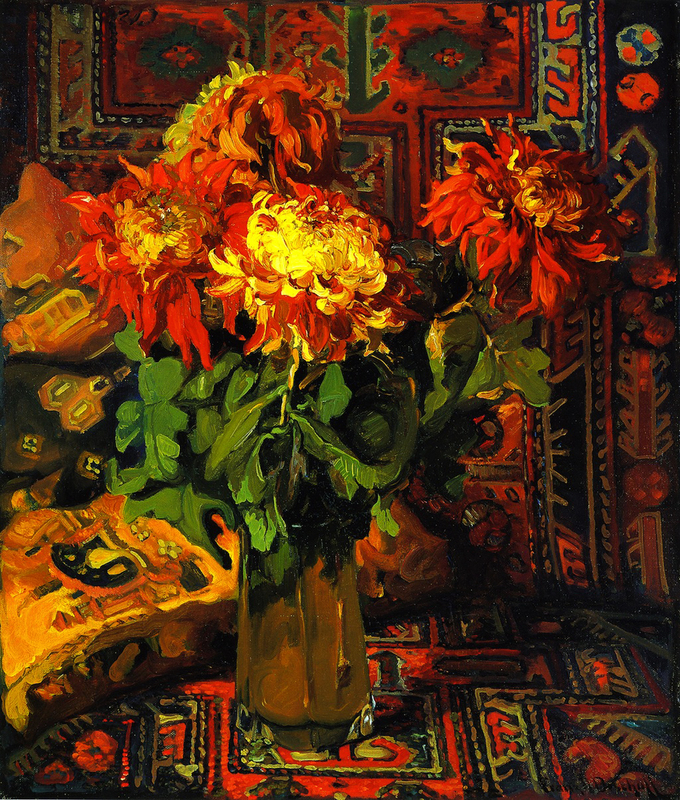 How do you feel when you look at the paintings? Do they evoke memories for you? Feel free to share your thoughts in the comments below. © 2018 FieldandGarden.com. All rights reserved. 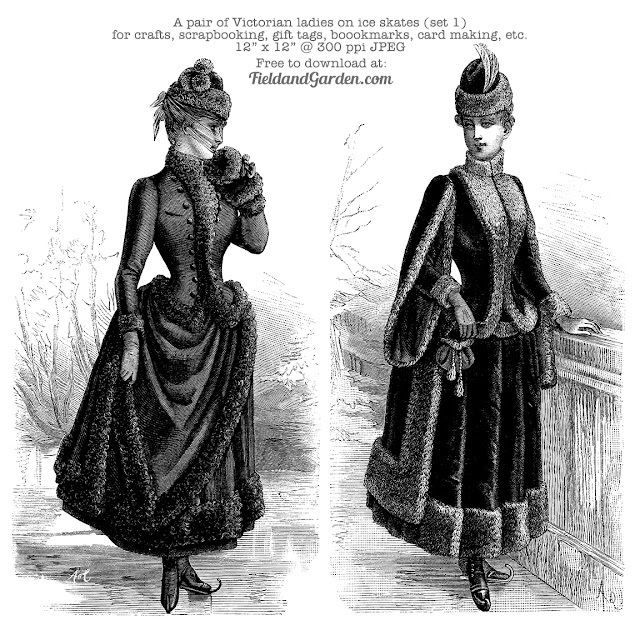 Antique engraving originally published in December 1878. 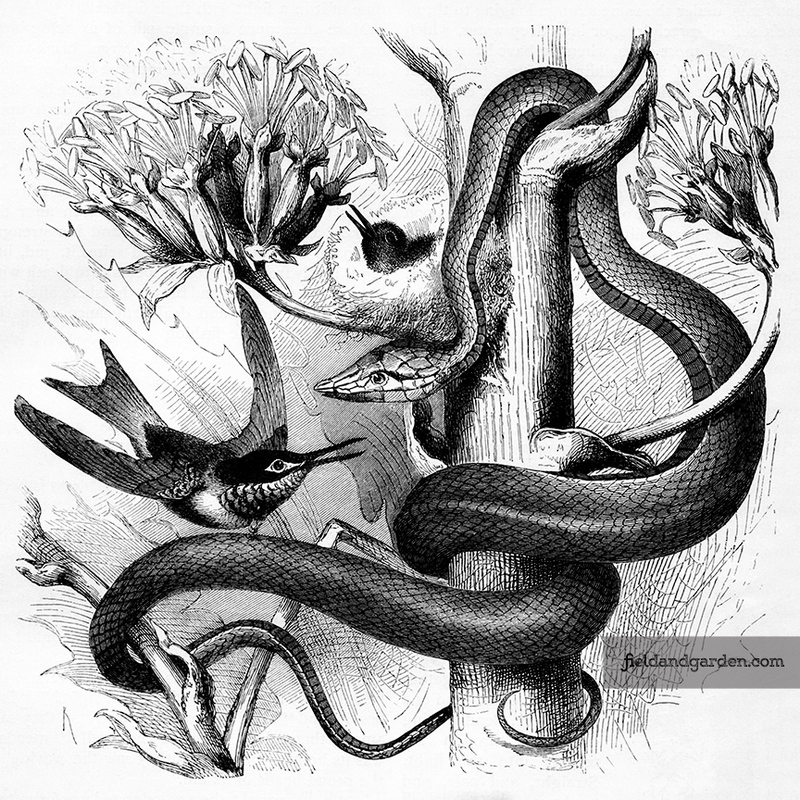 This illustration shows a mother hummingbird fiercely defending her nest against a snake who is hoping to feast on her helpless baby. Can this battle end happily for the avian family? You can download this free high-res 8" x 8" @ 300 ppi JPEG without a watermark for crafts, collage, scrapbooking or graphic design projects here. Franz Bischoff was born in Austria but immigrated to the United States in 1882. 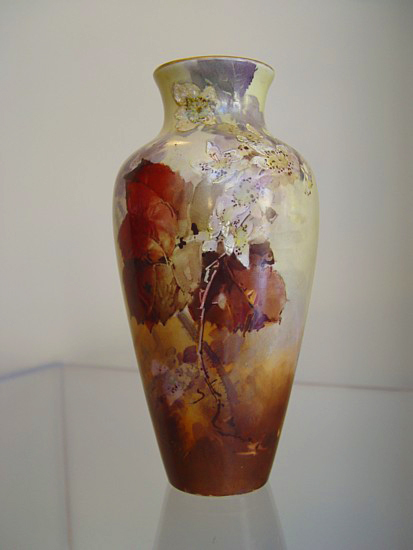 Trained in ceramic decoration as a boy, he continued to further his career in porcelain painting in his new homeland. He became well-known as a leading teacher of the craft, founding the Bischoff School of Ceramic Art in Detroit and in New York City, and as a master ceramicist who manufactured many of his own glazes. He decided to settle in California in 1906, ultimately building and completing a landmark studio home at 320 Pasadena Avenue in 1908. A description of the home says: "The building was poured of solid concrete and was one-and-a half stories high. 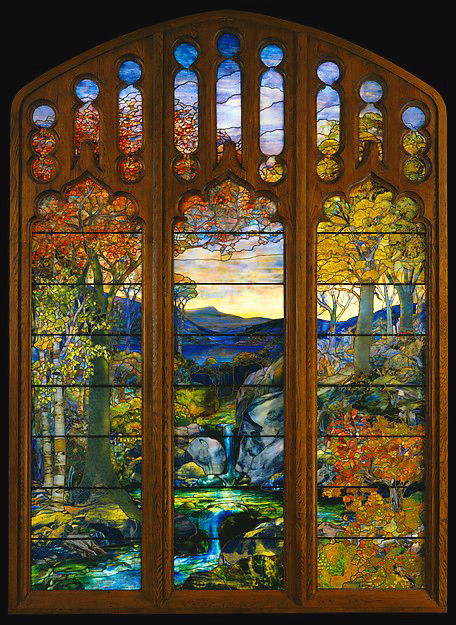 It was designed in the Renaissance style, with an imposing entry through massive oak doors with stained glass panels. The doorway was set beneath a classical pedimented portico, supported by two columns. The interior was divided between a large gallery, a studio and a complete ceramic workshop in the basement. The gallery measured 36 feet by 40 feet. It had high, concave ceilings lighted by several half-circle skylights. The floors were of solid oak covered by old Turkish rugs and polar bear skins. All interior doors and paneling were of natural redwood in the Gothic style. The furniture was of massive oak in the Mission style. At the west end of the gallery was a huge tile-covered fireplace. The wall space throughout was covered with paintings of flowers and landscapes, and in one corner were several oak display cases containing examples of Bischoff's painted ceramics. 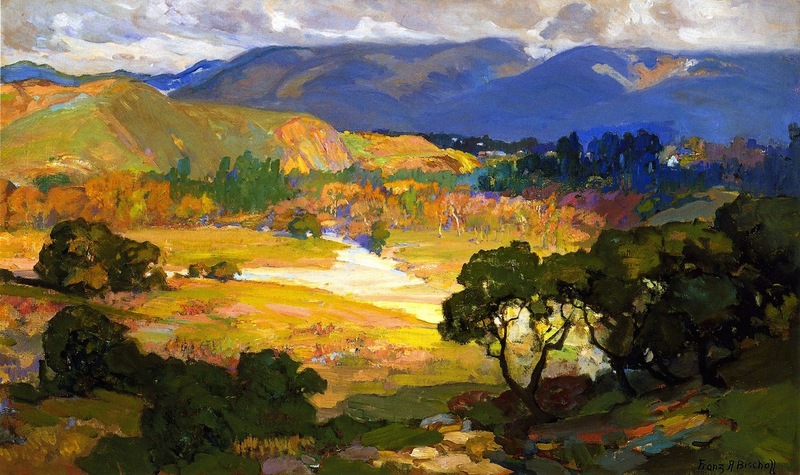 The painting studio had a large picture window that overlooked the Arroyo Seco, with a wide vista of the distant mountains. The studio furniture consisted of an easel, several easy chairs and low divans, all of Flemish oak." - a possible view from his studio window? In 1912, Bischoff went on an extended tour of Europe where he studied the works of the Old Masters and the Impressionists. 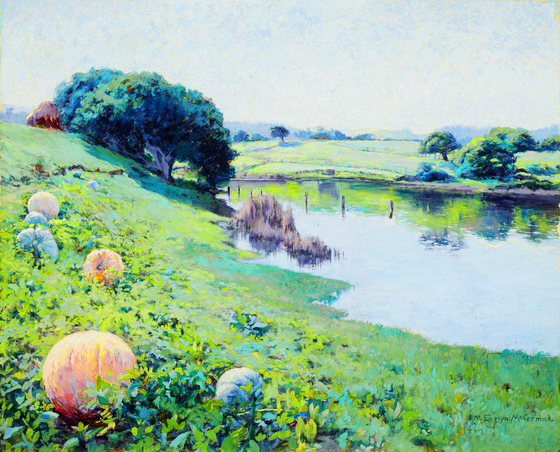 On his return to California, Bischoff turned to landscape painting and gradually abandoned porcelain decoration (Source: The Irvine Museum). 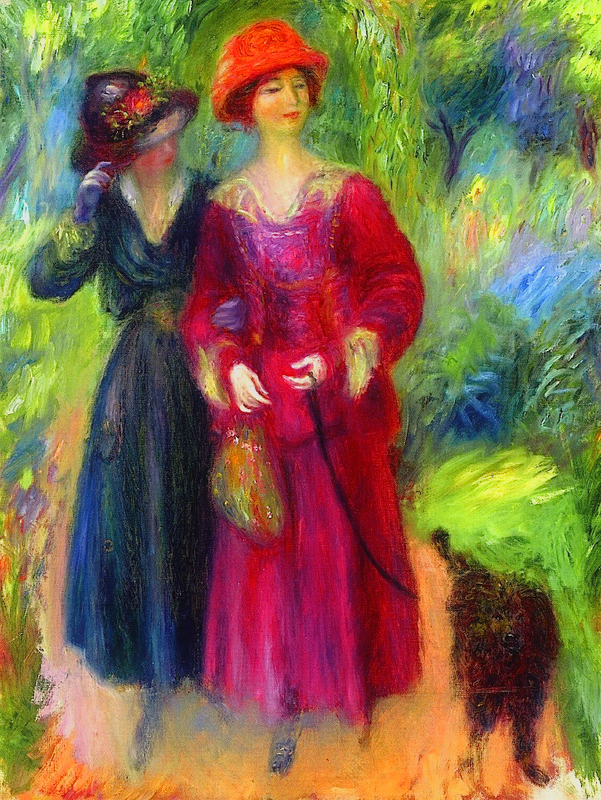 Although I've categorized Bischoff's works under Impressionism, I think they more accurately fall somewhere in between Impressionism and Fauvism, particularly his later works (c1920s) which show very strong, vivid colours. 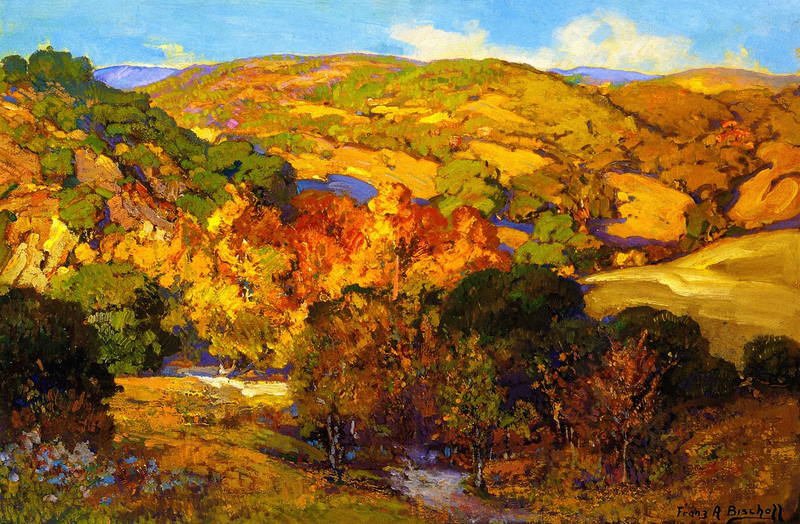 His background in design comes through his compositions - look how his landscapes follow clearly the rules of linear perspective, and he seems to have retained quite a bit of art nouveau graphical influence in his stylized renderings of landscape elements such as trees, rocks and mountains. This unique treatment, in addition to his use of jewel-like colour blocks, makes me feel like I'm looking st a Tiffany stained glass window. 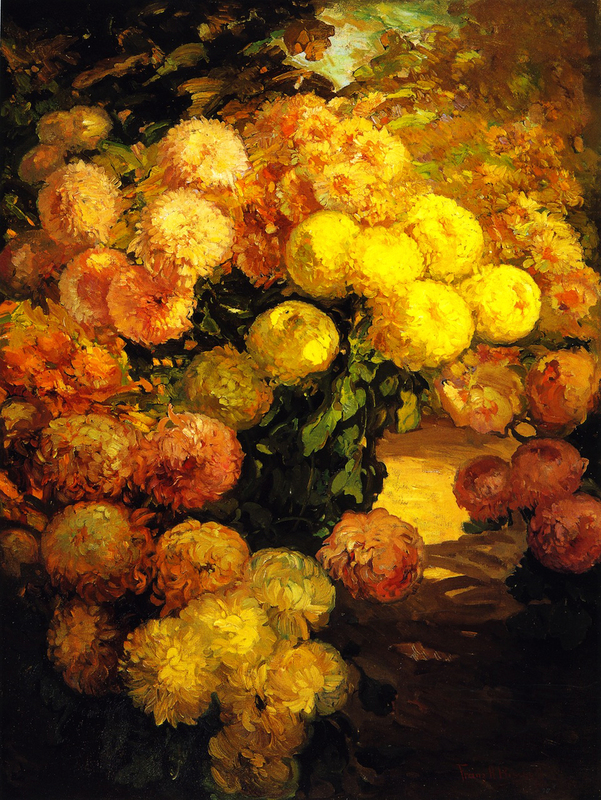 Finally, I am closing the post with two Bischoff paintings of fall's most popular flowers - the quintessential chrysanthemums! Aren't these warm colours lovely? I hope you have the opportunity of using these golden hues in your fall decorating to stave off the encroaching cooler temperatures. Pretty soon, possibly after Halloween, I'll be filling up the house and front yard with more blue-greens and reds as we head into the Christmas season but it is really nice to savour the yellows, oranges, and golds while summer is still fresh in our minds.